Hooked on Needles: Summer's over - but what a summer it was! Here in New England, we had the most glorious summer in recent memory. Practically every day was warm and sunny. Our vacation week was picture perfect. The weeks that the children were in swimming lessons were fabulous. We did have a few short stretches of very hot and humid weather, but that's what the ON button is for on our AC units! Besides the wonderful weather for summer activities, my sewing room saw quite a bit of action as well. The I Spy quilt tops should be getting quilted very soon, and by me no less! I will soon be training to use a long arm machine and will be able to do my own quilts! I can't wait! I also put together a few bags this summer, one for Grace and one for Nancy which I noticed she was using today at a poolside gathering! 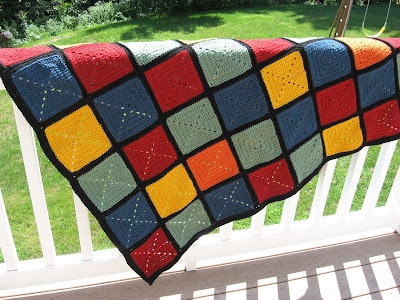 ...the first was this colorful granny afghan which I almost finished while we were away on vacation. It only took a few more stitching sessions after vacation to get it ready for my Etsy shop. It was sold within a few days and shipped off to Canada where it now keeps the back of someone's couch nice and warm. These slippers were another unlikely summer crochet project, made by request along with a three part video tutorial so Kari could make some for her new husband, and you can make some too. They are a quick and easy crochet project suitable for a beginner, and you know the chill in the evening air will be creeping into the daytime very soon! The other project I finished this summer is hot off my crochet hook this evening. It's another afghan - can you believe that? Two afghans in one summer - what was I thinking? Truth be told, I was thinking I needed to use up some yarn that was taking up too much space in my sewing room cabinets! This second afghan was made with the nine remaining skeins of this yarn that I had leftover from making this wedding gift afghan and a sweater for myself which I don't think I ever showed here. So in my next post, I will show you some pictures of this second afghan which will also be heading for my Etsy shop to keep someone nice and warm this winter. I'll also be sharing the pattern for this easy single crochet afghan in case you want to start on a cozy project to keep yourself warm this fall. Did you have a productive summer? shoooweee! You sure were busy up there in New England ;-) I hope to have that productive of a fall!